Call 602-621-0332 or email us for a free, no obligation shipping quote. Quick shipping available in U.S.A. and Canada to commercial, school, and most residential addresses. Pro-Grow is known for engineering built-to-last products and consistent quality manufacturing growers rely upon. This Commercial Grade Propagating Chamber W25 in. X L86 in. X H70 in. with 70 flat capacity (#1020) facilitates quick sprouting in a controlled temperature and humidity environment. Shelf spacing designed for easy access. Germinate a high volume of vegetable, herb, and flower seeds in Pro-Grow Germination Chambers. A popular application is starting nutrient rich and wonderfully flavorful MicroGreens, PetiteGreens, and Edible Flowers. Quicker germination rates and more uniform growth once outside the chamber contribute to successful year-round growing. * Dual Zone design: Pro-Grow's unique design with low heat, low density electric heaters and two heavy-duty Pro-Grow GFCI thermostats allow for two separately controlled temperature zones - run just one zone or both zones at the same time. Temperature range 40-100 degrees F. / 120V-1750W-14.6A. * Water Saver design: Pro-Grow's unique design returns condensed moisture to large custom stainless steel easy-fill water pan, reducing refills, maintaining moisture and humidity, and eliminating the need for external water tank. Custom stainless steel lower water pan has drain with (clean-out) plug. To avoid water from escaping, Pro-Grow developed their own efficient water recirculating design using high quality parts to endure heavy commercial use. Keeps water off of floor. By enginnering design: no hose connections (often leak onto floor and leave pooled water) and therefore no automatic water level control (which are risky for malfunction leading to flooding in greenhouse). Pro-Grow's design uses little water during a cycle. * Space Saver design on heavy duty swivel casters (two with locking brake, two without) promotes ease of use. Pro-Grow manufactures metal caster guards that are included. * Special Enclosure design: front and back are easily accessible by removal of special door panels, with a convenient storage rack on the chamber for removed door panels. These easy-to-clean, lightweight hollow core plastic door panels latch to create a secure enclosure on all sides of the chamber for excellent heat and humidity retention (our customers are very pleased with the effectiveness of the secure enclosure). This smooth, flat easy-to-clean panel material is an excellent choice for controlling molds and diseases. When not in use, front and back panels may be left off (and stored on rack) for excellent air drying of entire unit - a simple, yet proven important feature designed by Pro-Grow. * Additional features: Adjustable vents, heavy duty welded steel frame, factory custom paint, all interior stainless steel screws, stainless steel brackets and removable stainless steel shelves with air flow design. Athough more costly, the custom manufactured stainless steel open shelves are what engineering prefers to use for strength, durability, and airflow. See additional pictures. * Ships fully assembled on pallet (casters detached for transit). 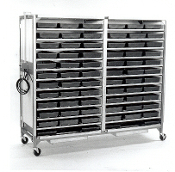 The only assembly required is easy attachment (by design) of the heavy-duty casters (secured inside unit for transit). No wiring required. This model ships with the two heavy-duty control thermostats already prewired and mounted to the unit by the factory. Est. shipping wt. 425 LBS. plus custom pallet. Due to the self-containing water design, this unit can be operated while secured (bolted) to the custom pallet (with casters off) if customers prefer. These easy to clean germination chambers offer an excellent physical control option in managing greenhouse molds and disease. *It is recommended to remove the seedlings from the Quick Sprouting Germination Chambers once they sprout. see our resource page for "Seed and Seedling Biology"